Why do certain groups and individuals seek to do harm in the name of God? While studies often claim to hold the key to this frightening phenomenon, they seldom account for the crucial role that religious conviction plays, not just in radical Islam, but also in the fundamentalist branches of the world's two other largest religions: Christianity and Hinduism. As the first book to examine violent extremism in all three religions together, Competing Fundamentalisms draws on studies in sociology, psychology, culture, and economics—while focusing on the central role of religious ideas—to paint a richer portrait of this potent force in modern life. Clarke argues that the forces of globalization fuel the aggression of these movements to produce the competing feature of religious fundamentalisms, which have more in common with their counterparts across religious lines than they do with the members of their own religions. He proposes ways to deescalate religious violence in the service of peacemaking. Readers will gain important insights into how violent religious fundamentalism works in the world's three largest religions and learn new strategies for promoting peace in the context of contemporary interreligious conflict. 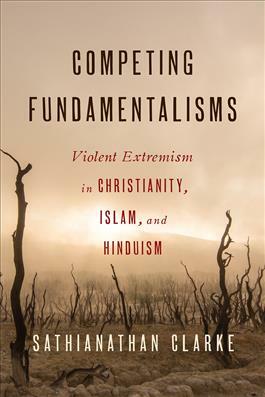 "Competing Fundamentalisms is intelligent and scholarly, a timely and courageous book that faces head on the fact of violent extremism in Christianity, Islam, and Hinduism. Clarke attends carefully and soberly to fundamentalism in all its variety, dissects the circumstances underlying religious violence, and digs down to core issues on how religions and societies work at their worst and their best. By taking up a comparative angle, he resists the temptation to blame one tradition or declare another innocent. He is sober and realistic, avoiding easy optimism and yet, in the end, also brings a deeply religious hope to bear: in God we can clear paths of peace more grounded than any extremism; In Christ, we can help build communities witnessing to God's peace on earth." "Competing Fundamentalisms displays a rare and precious achievement among books. Its author Sathianathan Clarke provides an accessible introduction to the phenomenon of fundamentalism across three great religious traditions, while also satisfying the demands of the probing theorist and the creative theologian. With this fusion of clarity, erudition, and constructive theological imagination, Clarke's book provides an indispensable bulwark against the religious beliefs that are fueling the engines of war and political violence today. This is the book I want on the shelves of my library, in my students' hands, and as a reference guide for today's religious and political leaders." "By putting religious fundamentalism in a comparative and global context, Clarke persuasively shows how shared religious themes in Christian, Muslim, and Hindu fundamentalisms promote violence and help further the spirit of aggressive competition rampant in today's world. This is an extremely timely, wonderfully wise, and astutely argued book." "Sathianathan Clarke has skillfully enlarged the focus of the term 'fundamentalism' from its current near-obsession with the Islamic variety and demonstrated the global scale of the phenomenon. Each chapter is tight and well researched (and engagingly written), and the final comparative chapter is elegant and illuminating. The book will be useful to those interested in international relations, as well as in religion and theology."